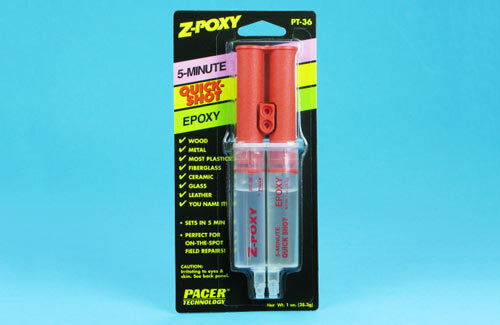 All Products > "5525770 Zap 1oz Quick Shot Epoxy Syringe"
Z-poxy Quick Shot Epoxy automatically dispenses equal parts of resin and hardener with one push. Vibration resistant and fuel proof, this epoxy is perfect for all types of hobbies and crafts. The 5 minute cure time means fast building and fast repairs.